It could go up, it could go down, or it could stay the same. Yes, after a 7 month hiatus I am alive. I, basically, stopped trading for that time, but have started again. 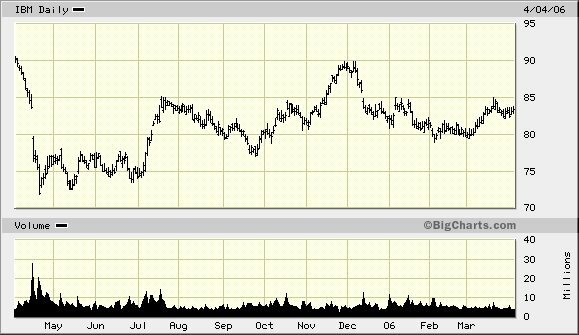 The chart above is of IBM. I'm long a bunch of the April 85 calls. This market is kind of weird right here so i don't know what to make of it. It wouldn't surprise me if we get some sort of blow off rally this month and then hit summer doldrums. You know the whole sell in May thing. The internet stocks were very week today, namely EBAY, YHOO and to a lesser extent GOOG. 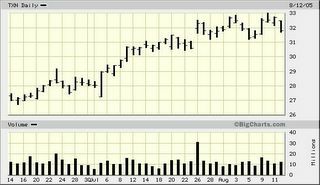 However, AMZN was able to finish the day in positive territory. 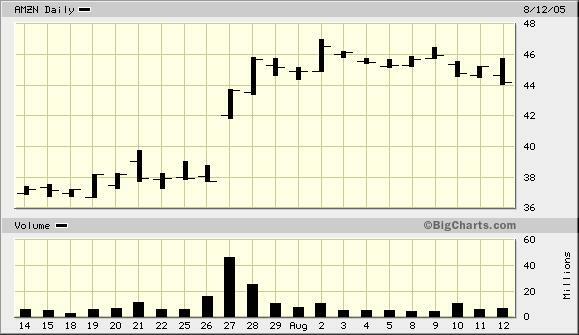 I was a bit perturbed to see the stock was down badly at one point after I had waken up from a nap, but it came back. I'm leaning long in the stock right here. The averages, though, don't seem to want to go any where. Every time I've tried to turn my TXN position into a front spread, the thing has run away from. It kind of pisses me off. 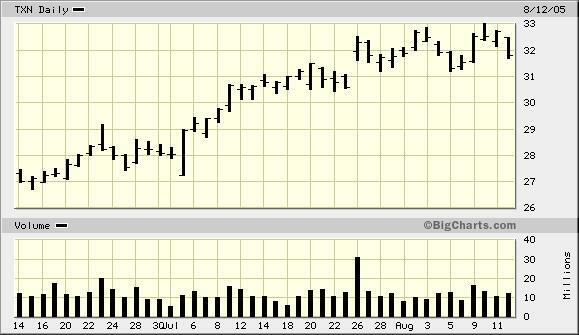 It's kind of hard to tell, but AMZN seems to have brokern a support level of 44.5 if you could even call it one. I covered a ten lot of calls on Friday which leaves me a little long coming into Monday. 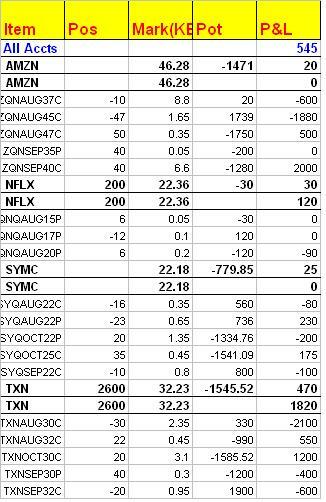 A very unimpressive day was turned in by TXN. It went from a new closing high to nearly a point selloff. I guess the downgrade of the chip sector by the GS analyst spooked investors. The stock was heavy all day with some large sellers out there. I dumped all of my long deltas and few extra. The stock looks to continue working lower this week. It may breech its recent lows. 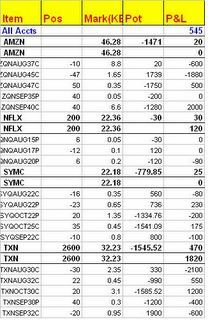 Here's the EOD position and P&L. 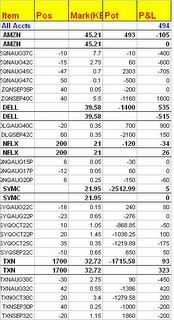 Notice I put on a 1x3 in Dell for earnings, that's gonna cause a little pain tomorrow. I'm looking at Dell tonight for possibly an earnings trade tomorrow. 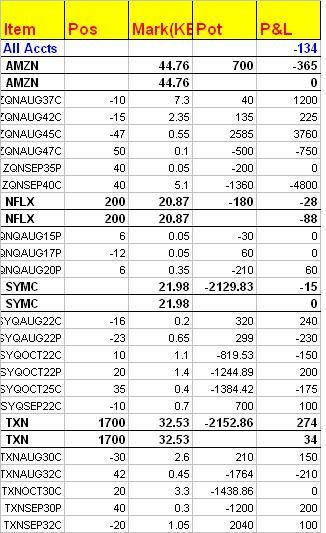 The implied volatilities are looking advantageous with Aug in the mid to high 30's and Sep in the low 20's. Also, the earnings may come in strong so I'm looking at something that may try and capture a pop higher on Friday. Right now, a Aug 40/Sep 42 2x5 ratio spread looks good. There is minimal downside with the possibility of a homerun on 10% move higher. IVs look to implode to less than 20. 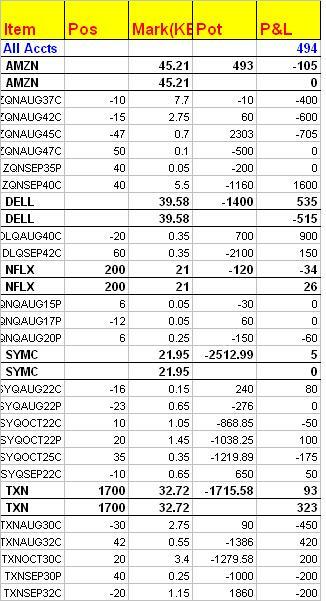 Here is end of day P&L and position. 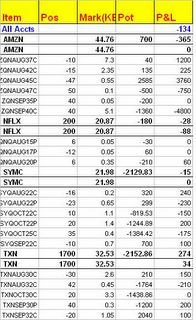 I sold a 15 lot of the AMZN 42 calls. I was long deltas and needed to hedge them. Otherwise, I didn't do anything else as I went to the Dodger game last night and stayed at friend's house in L.A. The early morning P&L demonstrate the danger of soft deltas. I came in this morning long about 1000 deltas in AMZN. However, with the stock up .60, my profit so far this morning is only $20.